Police say they apprehended a suspected bank robber late Friday morning in Boston's Charlestown neighborhood. 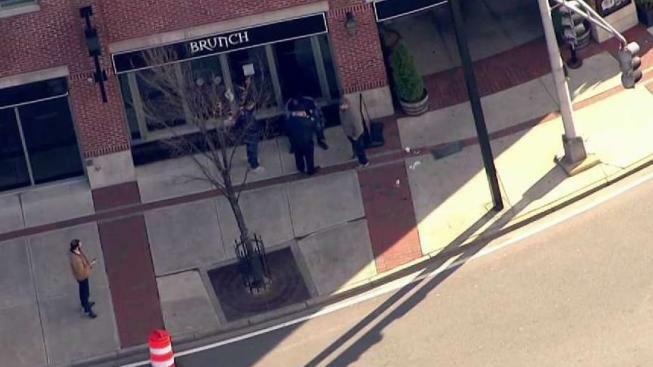 Police have made an arrest in connection with a brazen daytime bank robbery in Boston's Charlestown neighborhood last week. Thomas Hickey, 49, of Boston, was arraigned Friday in Charlestown District Court on charges of armed robbery (bank), assault and battery on an elderly person and assault by means of a dangerous weapon. Hickey was held on $50,000 bail and is due back in court Jan. 4, 2019. Boston police responded to a report of a bank robbery at the Citizens Bank on Austin Street around 11:30 a.m. on Nov. 30. Bank employees told police that a male suspect entered the bank, pushed aside an elderly customer who was waiting in line and pointed a gun at a teller while demanding cash. The suspect fled in an unknown direction with an undisclosed amount of money. Soon after the robbery, police said they had detained a male person-of-interest, but he was later released after questioning. During the course of their investigation, police said they identified Hickey as the person responsible for the crime. They found him walking in the same area on Austin Street where the bank occurred on Thursday afternoon and arrested him without incident. It is not clear if Hickey has an attorney.